Could u please provide answer to the following questions as follows? I got my BS and MS degrees in Computer Science in China before I came to US. Then I got my second MS in Computer Science in US. > Your experience with Oracle. When you started first? Has it been interest of your side or just a coincidence? My interest with database started with my Master degree thesis research on relational database more than 20 years ago. My Oracle database career started in 1995 shortly after when I took a database engineer position in a software company working on OCI and C++, PL/SQL and DBA. On that job, I really enjoyed learning and working on Oracle database technology on both applications development side as well as the database administration side. 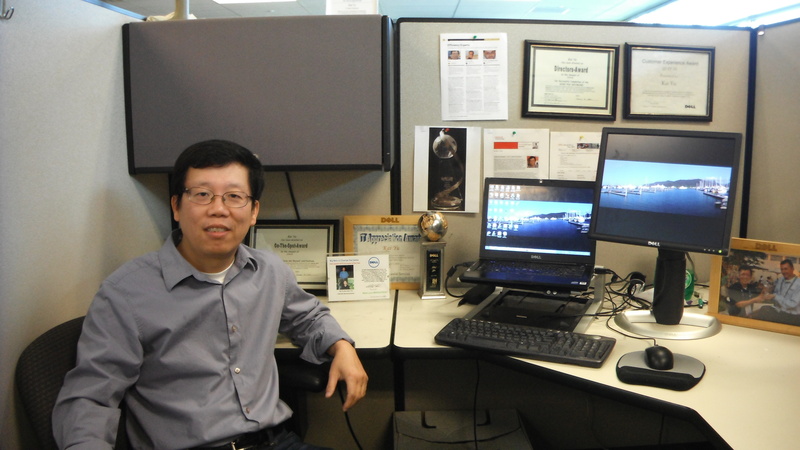 The technology really fascinated me and I decided to pursue my career in Oracle database. > What was the motive behind to prefer Oracle? Who you have been influenced by? > What would your preference of profession if not Oracle? > What motivates you in your job? > Do you give lectures on Oracle? Not official Oracle University class. But I have done several seminars on Oracle RAC SIG, which were recorded and managed by Oracle University and are publically accessible. I also have spoken at several IOUG web seminars and Oracle technology conferences worldwide such as Oracle OpenWorld, IOUG/OAUG Collaborate conferences, UKOUG conference, Scotland conference, Ottawa conference, OTN (Oracle Technology Network) Latin America conference tour and APAC conference tour. > Have you authored any book in Oracle? > Do you manage with your time as to read books on Oracle? What is the name of the book that you read recently? > What do you think on OTN forums? > Do you refer to the documentation? And how often does it happen? > What is the biggest mistake you have ever made during your DBA career? Back to the late 90’s, on the third day after I just started working for a small company, the rented small data center had some issue with its air conditioning, and I didn’t pay much attention and only forwarded the issue to the data center facility manager to fix it. But the fix was not done immediately. Next day, the database crashed, and I was not able to bring up the database as the database startup always crashed in middle of the instance recovery. After working with Oracle support, the root cause was identified that the data block corruption in the logs caused by the overheated storage prevented the instance recovery from completing. So we had to fix the storage issue and restore the database from the backup and recovered the database to the time right before this corrupted block was written. It was very painful and very time consuming process to get the main revenue generating database back online. Luckily I implemented the online database backup in the very first day when I joined the company. > What was your greatest achievement as an Oracle DBA? > What is you priority to manage the challenges you face? > How would you describe the essence of your success? According to your definition of success, how successful have you been so far? > What are your best skills which make you differ from others? > What’s your major weakness? > Have you ever lost your spirit? If so, what has been the reason and how have you overcome it? > What is the next success you would like to attain and your efforts to this end? > How do you balance your daily life with your career? > Please describe your one day summary of activities? I normally get up around 7:30am, taking my daughter to school and get into office around 9:00am. I work in office until 7:00pm. And after dinner, I started working around 8:30pm to 12:30am. During the night hours, I may also talk to my daughter about her school work or watch some pieces of movie or TV for a break. > How many hours do you work and sleep in a day? Around 11-12 hours work, and 6-7 hours sleep a day, and depending on the workload or other activities. > Where and how do you spend your daily, weekly and annual holidays? > Do you think about Oracle during vacations? > Do you have time or motivation to go in for any sports? If yes, which kind of sport do you go in for? > What’s your favorite meal and non-alcoholic drink? > What foreign languages do you know? > What’s your average typing speed? > Have you ever get involved in politics? > What are your hobbies? Swimming, playing Ping-Pong, military history. > How do you spend your free time? > What’s your biggest ambition? > What would be your advice to the beginners in Oracle? > Would you like your children to follow in your footsteps or take a different path in life? > Do you have any followers of you? I have seen some followers in my blogs. But I found that people are easier to find the materials from my blog entries than from my whitepapers and conferences although my 16 whitepapers and more than 40 conferences presentations listed in my Oracle blog (https://kyuoracleblog.wordpress.com) have much richer materials than those on my blog entries. I plan to find some time to extract some materials from those whitepapers and conference presentations and put them on some the blog entries so that the search engine can pick up them. > What is your vision on the future of Oracle? > Could you please take a photo in your office near to your desktop?